A battery-powered car will attempt to beat the UK land-speed record for electric vehicles later this month. 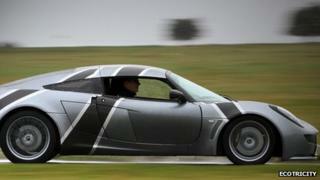 Nemesis, a heavily-modified Lotus Exige body, will be driven by estate agent Nick Ponting, 21, from Gloucester. The record attempt is due to be made at Elvington Airfield, near York, on 27 September. Nemesis was designed and built in under two years by a team of British motorsport engineers in Norfolk. It can travel from 100-150 miles between charges, depending on driving style, and can be charged from empty in about 30 minutes using a rapid-charger. The team believes theoretically the motors are capable of about 200mph but "real world" constraints like aerodynamic lift have to be addressed before the attempt. Mr Vince, who runs the electricity company Ecotricity, said he was quietly confident the team would break the record. The current record of 137mph (220km/h) was set by Don Wales, from Addlestone, Surrey, in 2000. A separate attempt to beat the record last August was thwarted after the vehicle's suspension was damaged by a pothole.